Highlights the value and benefits of a legal education at Cooley Law School. Cooley’s rigorous program of legal instruction taught by experienced practitioners equips its students with the knowledge, skills, and ethics needed to practice law competently and effectively. 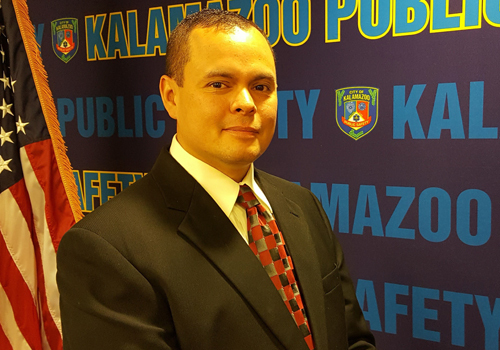 Rafael Diaz, a lieutenant with the Kalamazoo Department of Public Safety and a 2010 WMU-Cooley Law School graduate, knew from an early age that he wanted to go to law school. Every decision, from high school through college, was made to position himself for a career in the law. But, as he was coming to the end of his time in college, he looked at law school again. Married, and with a young daughter, Diaz decided it was not the right time to make a commitment to law school. 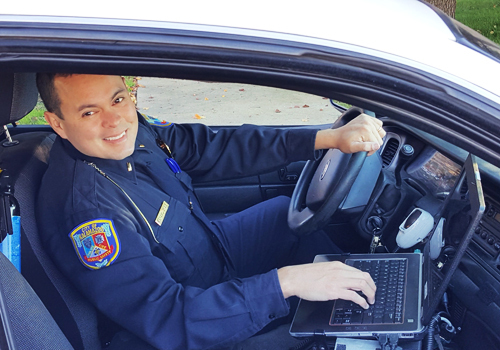 After five years at the Holland Police Department, Diaz joined Kalamazoo Public Safety in 2005, giving himself more time for family and the opportunity to dream about law school again. Diaz learned that WMU-Cooley’s many scheduling options could make pursuing his dream possible. 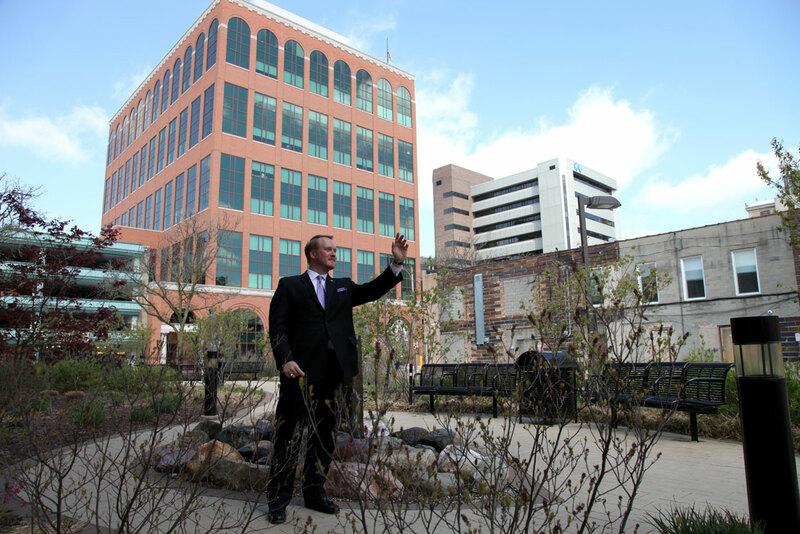 In 2007, he started law school at WMU-Cooley’s Lansing campus taking classes during the day, knowing that if his work schedule changed, he could continue by taking advantage of other scheduling options the law school offered. He continued to work with area high school students, teaching them what it might be like to be a police officer. He enjoyed working with the students, plus he found that this work schedule allowed him to attend evening classes and more time to study. Law school was tough, but all Diaz’ memories are positive. “My experience at WMU-Cooley was one of the best times of my life,” Diaz recalled. “Not only was I busy at work, I was busy in law school. I loved being challenged. I also met a lot of great people. I had a tremendous amount of interaction with people and have stayed in contact with many over the years and built lasting friendships. 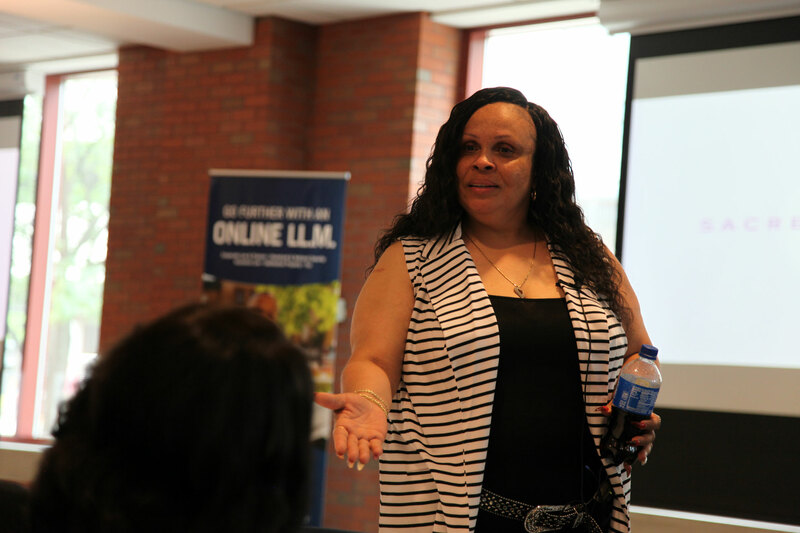 For Diaz, the professors at WMU-Cooley stood out as exceptional teachers. They also made themselves available to help students. How has a law degree helped in a career in law enforcement? Diaz explained that his training and legal education have made him a better person, both personally and professionally. “The law degree is what has broadened my eyes, my perspective, and my approach to so many different issues,” he stated. “I have gone up the ranks, and am now a lieutenant and I got there in a relatively short period of time. I believe it is because the work that I have done and the work that I can do is appreciated. By setting myself apart from other candidates, I have been allowed to progress quickly. It really is a wonderful intersection of my love of law enforcement and my love of law, and the practice of it as an attorney. “WMU-Cooley set me up for success. They taught me how to look at a problem, any problem really, then apply specific set of skills to analyze the problem and come up with solutions, looking at many sides of an issue. Sometimes in law enforcement we get stuck in only seeing it from one side. That can lead to a lot of frustration when we only want certain outcomes. Diaz knows that he owes much to the unconditional support and love of his family. But Diaz also had two children to factor into the equation. Even with the full support of his family, Diaz knew there would times where his family would suffer. “What I tried to do was balance life as much as I could,” suggested Diaz. “Anything that I had outside of school, work, and family was gone, and I still haven’t picked up the game of golf since, but that’s OK. I want dinner time with my family. I encourage anybody who is looking at law school to carve out time for your family, regardless of how busy you are at work or school. In my mind, if it doesn’t work with family, then it’s all wasted. “During family time, you put the books to the side, sit down, eat dinner, or watch a show, then when they go to bed, get back at it. I tell you what, I got a lot of strength from my family. Even during those years, I coached my daughter in softball and soccer and my son in baseball and soccer, because I love coaching. You can really tackle anything when you have that family support. “I was truly blessed because my wife, my daughter, my son have always stood behind me and given me pushes, like, ‘Hey dad shouldn’t you be studying? Why don’t you get after it?’ I am thankful every day for the tremendous support of my family, and at some level I believe it was good for them, modeling good study habits, punctuality, and dedication. With Public Safety, Diaz believes he has one of the most exciting and rewarding careers in the world. The efforts have, over the years, improved the treatment and care of the individuals in crisis. Diaz may have taken the road less traveled to get him to where he is today, but he has succeeded at every turn, proving to one and all that there is more than one pathway to success. This story is also published in the Summer 2017 Benchmark. 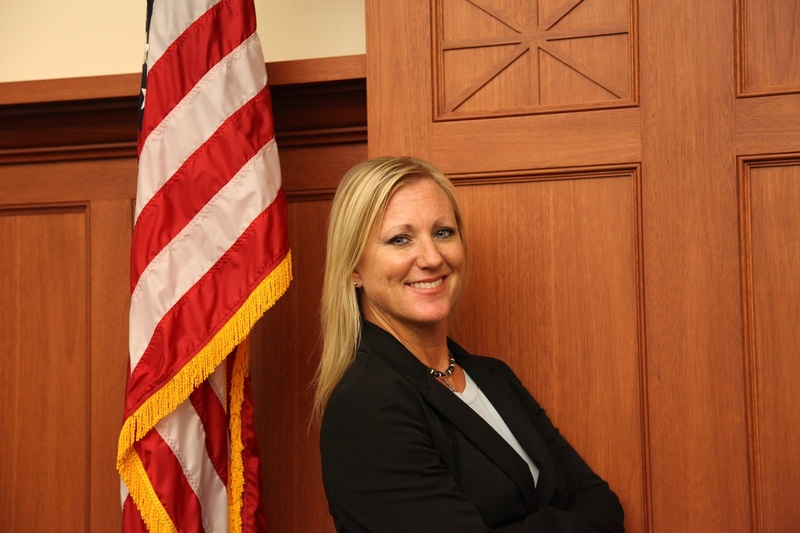 CLICK HERE to see the story and to read about other interesting WMU-Cooley Law School graduates. Naples, Florida is well-known as a great resort destination, with miles of white sandy beaches, calm waters, fishing, high-end shopping, golf courses, and even dolphin-watching. What’s less well-known is that Naples is a premier global research and training destination for orthopedic surgeons. John W. Schmieding (Moore Class, 1993) is the senior vice president and general counsel for Arthrex, Inc., a world leader in orthopedic surgical device design, research, manufacturing and medical education. Its mission is helping surgeons treat their patients better. Since 1981, when Arthrex was founded by Schmieding’s brother, Reinhold, Arthrex has experienced tremendous growth and demand for its products. Its global headquarters in Naples is nothing short of impressive. The vibrant atmosphere of rapid product innovation, medical research and surgeon collaboration is noticeable on its sprawling campus. Surgeons come from around the world to learn about new products and techniques through hands-on surgical skills training programs at this premier medical education facility. For the past 15 years, with his educational experiences and leadership acumen, Schmieding has been a steward of the legal framework which has facilitated Arthrex’s incredible growth and economic success in the Naples community and around the world. That was the moment I knew I wanted to be a lawyer, not because of the law but because of the analysis. Even today I encourage my own children to be inquisitive about history and to think about how things are developed and where things belong. Inquisitiveness is an invaluable quality. How was your time at Western Michigan University? What was your undergrad focus? I was focused at Western to find a degree that would give me a leg up in law school. I entered WMU’s Criminal Justice program, in addition to a Courts minor – which resembled prelaw courses. I finished the requirements within two years and my advisor told me I should pursue another major. I always loved writing, so I chose English and Creative Writing. Learning how to creatively think and express those thoughts in writing has helped me tremendously throughout my career. It is one of the skills that I find lawyers are often lacking – the ability to cogently write creatively to convince. The law has many opportunities for creative insight. By my junior year, I was ready to apply to law school. It happened that my uncle knew Cooley Law School founder, Justice (Thomas) Brennan. He worked with him and went to University of Detroit Law School with him. He advocated for me to go to Cooley. I loved the idea of a practical legal education. My creative mindset loved the idea. I wasn’t looking for theoretical insight or theoretical application of the law. I wanted to practice law. I wanted to be of service to people. My father always inspired me to be of service. Growing up, I watched him help others and I wanted to do the same. I gravitated to Cooley and enjoyed it from the first moment I got there. Tell us about your WMU-Cooley experience. Once I began law school at Cooley, I could tell it was going to be a drastic change from my undergraduate program. The intensity of real world operations and learning about how the world works was immediate. There are many moments that stick out in my mind. My first memory was standing in front of the class with a microphone, being grilled on our previous night’s assignments. You learned quickly to be prepared for class and never, ever come unprepared. That lesson has helped me throughout my career. Law school was a tremendous challenge. I admit I was never an A+ student. That didn’t stop me though from embracing classes I wasn’t comfortable with or actually feared – like Tax Law. I remember making the conscious decision to dive into classes that challenged me. Surprisingly, I did well in those classes and even got an A in my Tax classes. It all gave me great confidence. Receiving the blue book award for Constitutional Law II was the highlight of my law school career. Up to that point, I had never been very close to the top of the class, but I applied myself diligently to that class and wrote a wonderful blue book. I was honored to receive that award and it hangs in my office to this day. One experience during law school is forever etched on my mind. I was hurrying to take an exam. I was walking too fast down those large marble stairs in the Temple Building. Justice Brennan was walking up just as I was hurrying down. I literally fell down the stairs in front of Justice Brennan! I’ll never forget that. I was so embarrassed. Yet, Judge Brennan helped me up and was very gracious. I’m sure he remembered what it was like to be a student taking exams. I appreciated him and respected him highly. Oddly, this was one of my fondest memories of my time at Cooley. 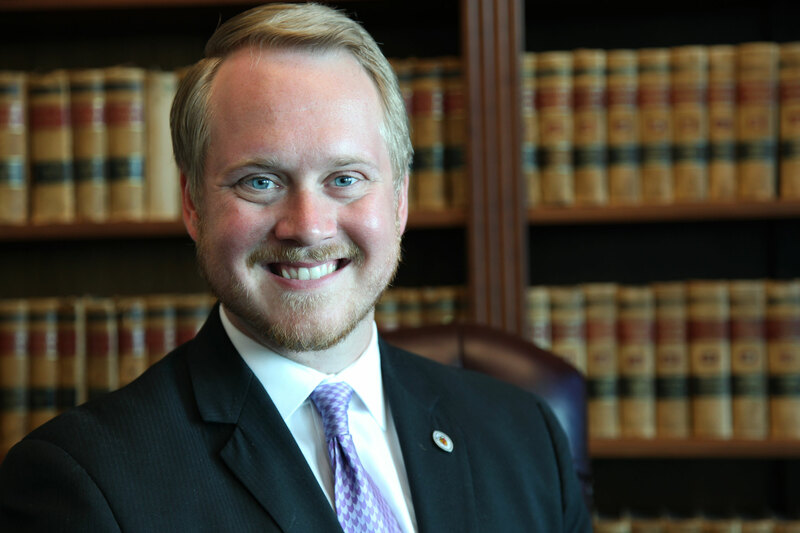 How did WMU-Cooley prepare you for a legal career? My law school experience enriched me with confidence and the practical skills necessary in the professional world. The skills I gained in my research and writing classes were immediately applicable in my work after graduation. 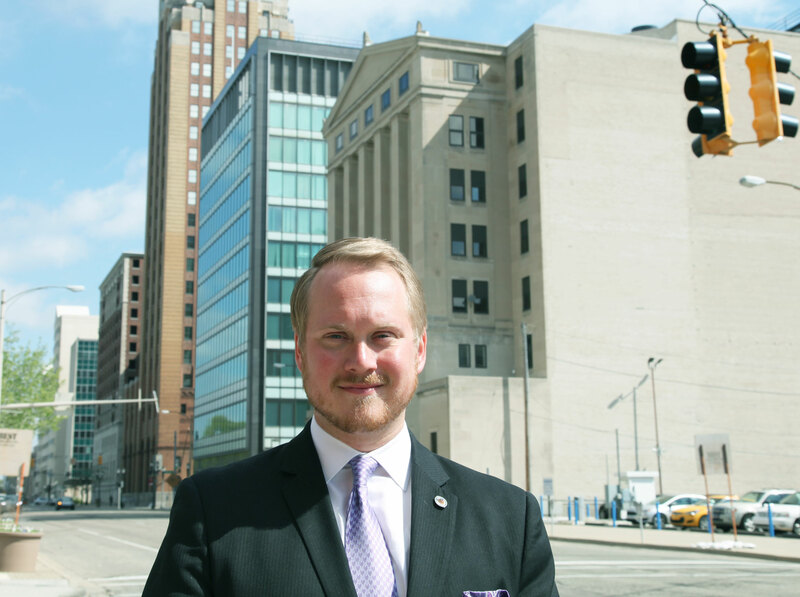 I worked for a small accounting firm in downtown Detroit before I started my legal career. I did a lot of research regarding bond fund accounting and arbitrage and really enjoyed it. I applied things I learned in law school directly to that job. Then I hung out my own shingle, and then worked for a small firm, then a large firm, and now I am in-house at a large multinational corporation. When I first practiced for myself, I was doing minor litigation matters. Yet within weeks, I had my first small district court trial. The opposing counsel walked into the courtroom and I handed him his trial book, tabulated and organized, just as I had learned in law school. He looked at me dismayed and said, “You are way too organized.” I ended up winning that matter, which was pretty gratifying. It was a thrill to actually apply all I had learned so quickly, and I didn’t even have a mentor at the time. I knew I would succeed as an attorney. In early practice, I did a lot of civil procedure cases, and leaned on all I learned during Civ Pro. I represented a client who had a real estate matter go south. They hired me to try to iron out the deal. It ended up in litigation where we had to file suit against the sellers of the property. The sellers hired a very famous, well-respected, University of Detroit Civil Procedure professor. Here I am, out of law school only a couple years, and I am going up against someone known to be an expert in this area of law. Well, I ended up winning. The claims were based on a failure-to-disclose matter where the seller failed to inform the purchasers of some water damage to the residence. We ended up going through motion practice, and I survived all the complex procedural attacks seeking dismissal on procedural grounds from this professor. I won every motion, and before trial, the judge tacitly recommended both counsels to settle. The sellers ended up paying us for the undisclosed damage. What a great challenge and confidence builder! Tell us about your path to Arthrex? As my career progressed, I started working for larger firms, including a regional firm based out of Pittsburgh called Doepken, Keevican and Weiss. We did everything from commercial litigation to mergers and acquisitions. I was exposed to a wide variety of topics, but Cooley prepared me for that, too. By now I had a wealth of experience and could apply the depth and breadth of my experience anywhere, including as general counsel for Arthrex. Since the 1990’s Arthrex was growing at a tremendous pace and the foundational legal frameworks needed to be established. Fifteen years ago, my brother asked me to join the team as his legal counsel. We had nearly 100 employees at the time. We now have over 4,800 worldwide, 2,800 in Southwest Florida. When I joined, it was a legal blank slate. It was an honor to have the opportunity to help foster and prepare this company for growth and to help with the great medical vision my brother created. We are a very unique organization. We make medical devices for orthopedics and are the largest sports medicine manufacturer of medical devices in the world. We are committed to doing things in a way that public companies simply don’t. We are on a medical mission, not a shareholder value mission, in everything we do. It was a rewarding challenge to build ethical and legal frameworks responsive to the needs of our mission. I had to apply an entire range of legal thought and experience to make sure our business foundation was legally sound. I worked to assist in patent prosecution, handle product liability matters, oversee insurance issues, advise on FDA regulations, advise on compliance regulations, and handle all corporate governance, contracts and a variety of other things. I now have 10 attorneys who work for me globally. The open canvas of the position has been a continual painting. Every day I assist in the growth of our worldwide expansion. What a tremendous experience and privilege it has been! I get to work with some of the best lawyers in the world, and it’s very humbling. What’s important for any attorney is to be open to learning new methods and creative ways of doing things, no matter how long we have practiced. I am excited to see what the future holds. What is it about your career that makes it the perfect fit for you? I believe my practice reflects my personality. I have had a wide variety of experiences and have never allowed myself to be type-cast into one role. I love that I am able to sit with a design team of engineers and help develop solutions to medical problems. I am actually an inventor on several patents. The diversity in my work allows me to explore new areas and challenge myself and others. A lawyer’s mind is essential in any problem solving group. Never underestimate your ability to enter a business discussion, a mechanical discussion, a failure or risk mode discussion, because it informs the conversation in a different way due to our legal training and experience. We are able to solve problems, critically look at things and apply knowledge in ways others cannot. My personal life is also varied. While I spend most of my time with my four beautiful children and my wife, I am also involved with Leadership Florida where I am in “Class 35.” It is a wonderful program where we learn about issues the state is facing in order to help serve our local community better. I also sit on the board of the Greater Naples Chamber of Commerce, and am active in leveraging Arthrex’s needs for the betterment of our community. My current focus is on workforce training and housing. My family is important to me and I spend a lot of time with my son in the outdoors and enjoying Florida’s natural beauty with my daughters. We also spend time in northern Michigan enjoying the beauty of the Great Lakes. Both states have so much to offer. I am also an avid reader and love intellectual pursuits. His advice for me was to find a corporation and obtain an equity interest in the company. I sat back and thought that is not what I want to do. My goals have nothing to do with finance. My belief is that your passion should drive your pursuits, and my passion was our profession; serving as a pillar of democracy. This is why the Arthrex mission is such a great fit. Focusing on passion drives innovation and creativity, not on a financial outcome of the matter. It turned out to be a wonderful business model for Arthrex, and we are extremely successful because we are focused on our goal of helping surgeons treat their patients better. But the success came after the mission. In that commitment, unlike many of our competitors, we are committed to building and manufacturing our products in the United States. Ninety five percent of our products are made here in the United States – 70 percent of those are made right here in Southwest Florida. This is a purposeful commitment. Our mission drives everything we do. Arthrex also continues to reinvest in expansion. We just built another 200,000-square-foot manufacturing facility here in Southwest Florida and we are building a 300,000-square-foot facility on the main campus in Naples, which will employ another 1,000 people over the next five years. We are building for growth, and we are committed to keeping that manufacturing here in the United States. Unfortunately, not everyone appreciates our business model and success. Some competitors have lost in the market to our innovation and creativity, and rather than working to better their business they have attempted to challenge us in court. Patent law was not something I was very involved with in my private practice. I was only slightly involved in certain patent reviews and due diligence on patents. Yet when I arrived here, I was immediately aware of how industries in our field utilized patents to gain an advantage – an advantage not intended by the system. Having the ability to overcome difficult situations is a necessary life skill. It is something I first learned in law school during Professor Roger Needham’s Civil Procedure class. There was no question in anyone’s mind that he was an extremely intelligent man, but he was extremely demanding and his classroom demeanor was nothing short of scary. It was a challenge to live up to his expectations. While I found it frightful, it was such a wonderful experience. After a very tough term in Civ Pro, where half the students failed, I ended up with the second highest grade in his class – an accomplishment I never expected. Ultimately, what Professor Needham did for me, and for all of us, is teach us a world lesson – how to deal with difficult people. It was a wake-up call for many students. That classroom lesson has been practically applied throughout my career. If you are looking for one last piece of advice, I suggest you strive to understand how to communicate and collaborate with others, and use your passion to understand your client’s mission and join them as a partner, not as simply a service provider. If you do, you will find great success in your career, and in life.